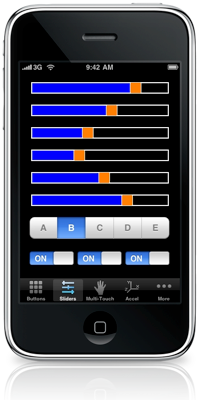 OSCemote (pronounced “Ah-ski-mote”) is a remote control application for the iPhone and iPod touch. It lets you send Open Sound Control messages to other programs like Max/MSP, Puredata, OSCulator and many others. Those programs then play music or respond to the remote control however you want them to. Open Sound Control is a modern networked cousin of MIDI but it is used for many things besides music. How do I use OSCemote? You’ll need OSCemote on your iPhone or iPod touch and another application running on your computer. The other application needs to understand Open Sound Control. See the examples below for details. Open Sound Control and OSCemote are both very hacker/tinkerer friendly. That means that you will need some technical knowledge to tap into their full potential. If you have never used Open Sound Control before, you should read about it here before buying OSCemote. Check out this awesome video of Josef Prusa using OSCemote to control his RC car via Max & Arduino. Featured in the O'Reilly book iPhone Hacks. He has even posted detailed instructions. Thanks Josef! iPhone controlled R/C car from Josef Průša on Vimeo. Here is OSCemote controlling SuperCollider - both on the same iPod Touch. Thanks DJ Cylob! Here is uranodai’s OSCemote to ActionScript library in action. Thanks uranodai! OSCemote to ActionScript 3.0 Multi-Touch Demo from uranodai on Vimeo. OSCemote sends and receives messages over Wi-Fi via the Open Sound Control protocol. What about Bluetooth or USB? 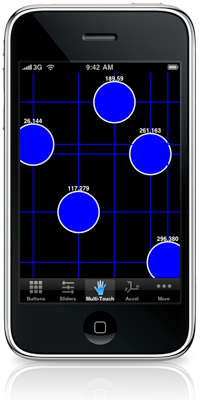 Unfortunately the Apple iPhone SDK does not offer support for this, so I cannot add those features. There is no direct support for MIDI in OSCemote because MIDI is not a network protocol, but you can use a separate program to translate OSC messages into MIDI. OSCulator (Mac) and Pure Data (Windows, Mac & Linux) are both able to do this, but you will need to know how to use those programs also. OSCulator is pretty easy to figure out, but Pure Data is quite complex. See the examples below for details. Please see the tutorials hosted on the OSCemote Google Code wiki. You can find a complete list of the OSC messages that OSCemote sends as well as details on creating custom panels on the OSCemote Google Code wiki. For help with OSCemote or to report bugs, please contact me directly.